Small business owners are great at the core activities of their business. For some that is creating products and others, providing services. This is because entrepreneurs are typically “idea people” at their core. Some are even great at developing an initial customer base. Unfortunately, many business owners don’t know the crucial ins and outs of business management. Many times, business management skills is missing link between where a business owner is now and where they want to take their business. 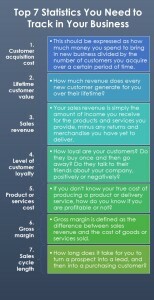 Track the following 7 metrics and you will have a much better understanding of how to make your business successful. If you have ever watched Shark Tank, you have heard of this one. How much does it cost for you to acquire a new customer? This critical business metric can include a lot of factors. Your personal time, marketing efforts, business insurance, utilities, payroll, and several other expenses come into play here. Your customer acquisition cost should be expressed as how much money you spend to bring in new business divided by the number of customers you acquire over a certain period of time. This is one that I often spend plenty of time on with new clients. How much revenue does every new customer generate for you over their lifetime? Business owners often concern themselves with the amount of profit in a single sale. That is a vital metric to track, but lifetime customer value is even more important. Coupled with knowledge of your customer acquisition cost, knowing your lifetime customer value reveals how much money you can spend on lead generation, advertising, marketing, and other forms of pursuing new prospects. This is the fun one. Everyone likes seeing a full cash register at the end of the day. Your sales revenue is simply the amount of income you receive for the products and services you provide, minus any returns and merchandise you have yet to deliver. Look at this number very closely to ensure you aren’t sugar-coating the figures. If you know your long term sales goals, you can easily reverse engineer those number and have monthly, weekly and daily sales goals. How loyal are your small business customers? Do they buy once and then go away? Do they talk to their friends about your company, positively or negatively? When you give someone what they want, and add value, you have a chance of creating a very loyal customer. Use surveys, point-of-purchase feedback, and exit polls to discover what you need to do to earn your customer’s loyalty. Think about how you use certain loyalty cards to get special discounts at places you visit. You using that card, helps that merchant track your loyalty. If I lost you somewhere before here, time to wake up. This one is the most under tracked metric that I find most small business owners have never completely figured out. How did you come up with the cost of your goods or service? This is also referred to as cost of goods sold (COGS). If you don’t know your true cost of producing a product or delivery service, how do you know if you are profitable or not? When figuring this out, it is different than the COGS used for tax information ( beginning inventory + purchases – end inventory = COGS.) Take everything into consideration. Watch for an upcoming post on how to calculate your COGS or contact me to discuss how we can help you figure this out. Gross margin is defined as the difference between sales revenue and the cost of goods or services sold. 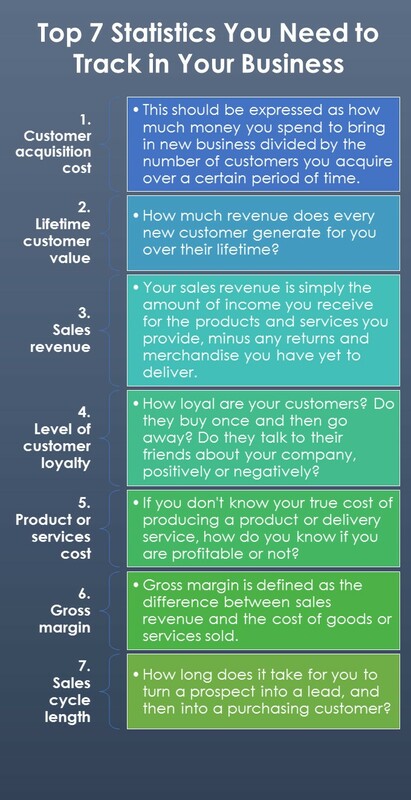 When you know your sales revenue (#3) and cost of goods sold (#5), you understand how much money you are making or losing when a transaction takes place. Your margins may vary depending on which product or which service someone purchases, but you still should have a clear idea of what the margin is. How long does it take for you to turn a prospect into a lead, and then into a purchasing customer? Knowing your sales cycle is extremely important, because you will understand exactly how many times, and in which way, you need to communicate with a prospect to result in a sale. Sorry Steve that you find it spammy that we request a way to contact folks that request a free assessment. No other way that I know how. No app here, just a live conversation with me or one of my coaches.